Iban/Queer Koreans of New York is a social, discussion, and support group and political advocacy organization for lesbian, gay, bisexual and transgendered Koreans, Korean Americans, and Korean adoptees. The group emerged in the wake of the November 2, 1996 Korean LGBT Forum co-sponsored by the Korean Gay Organization/Chinkusai, the Committee Against Anti-Asian Violence and The Audre Lorde Project and hosted by the Korean American Association fo Greater New York. Iban/QKNY, which began as a small group of friends, is actively engaged in the process of constructing a queer Korean community here in New York City. 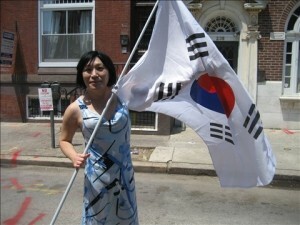 Since its founding, the organization has sent a contingent of seven members to KASCON, a national Korean American student conference held at Yale in March 1998; produced a 12-page bilingual newsletter in June 1998; and held a Pride Month reception, which attracted over 120 people, including some non-Koreans. In November, the organization co-hosted a party with Chingusai-NY, a group of Korean speaking gay men. Iban/QKNY is also a co-sponsor of the new and popular Asian women’s gatherings organizaed by Persimmon Space. As a participant in ALP’s Incubator program, Iban/QKNY held a strategic planning retreat at ALP at the end of January, facilitated by Veronica Flores. This article first appeared in the spring 1999 issue of The Missive (the newsletter of the Audre Lorde Project).